We live in the best of times; but this happens also to be the worst of times. On the one hand the marvellous advance of modem science and technology has conferred a cornucopia showering comforts and luxuries galore, not dreamt of even in the Arabian Nights. But this is only one side of the coin. The reverse side displays mindless cruelty, injustice, corruption, etc. How to tide over this quagmire? We live under tremendous stress and tension. There is no happiness. How can we claim happiness our birthright? It is here that devotional stotras like Dvadasa Stotra help us to regain our balance. Fulfillment can be approached in many ways. Of these Bhakti is the easiest and best. And to deepen the feeling of devotion Sri Madvacarya who is devotion embodied can be our able guide. In these twelve hymns, Dvadasa Stotra, Sri Madvacarya has gathered together all the excellences which distinguish Sri Maha Vishnu. By repeating the various appellations by which Lord Vishnu can be adored the devotional mind attains tanmayata, merging in the great glory of the Lord. In the Sri Krishna Karnamrita we are told that the Gopis of Brindavan had nothing but constant remembrance of Krishna; that they could not speak of anything else but the divine names of the Lord. A Gopi cries out for sale Govinda, Damodara and Madhava. Instead of curd, butter, etc. When we read Sri Madvacarya’s Dvadasa Stotra we are thrown into a similar state of mind. We cannot help chanting the various names by which Vasudeva is distinguished. 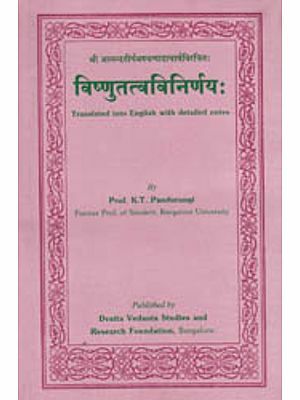 This edition of the Dvadasa Stotra, transliterated into English and lucidly translated by Sri Kowlagi Seshachar, Retd. Principal, S.M.S.P. Sanskrit College, Udupi, is an invitation to us to dedicate everything to the Lord and float in divine bliss. I am grateful for the opportunity offered to me herein of associating myself with a devotional publication of my dear and esteemed friend, Sri Kowlagi Seshachar, in whose friendship of four decades I have received more than I could give. He took considerable persuasion from me to do this translation of the celebrated hymn of Sri Ananda Tirtha. Though he shared my appreciation of the original, certainly with greater understanding, his standards of excellence and accuracy were so high that his exertion in this direction appeared uncertain. That he eventually did it is due to me and that the translation of the precious document of the Acarya’s personal devotion to his God is meticulous and perfect is entirely due to his exacting self-criticism. Not knowing what it is to rush to print without thoroughness, he has consulted some important commentaries, made careful choice of readings, and determined the import of every word, sentence, hymn chapter with exhaustive consideration. It is commendable that this first English translation should go forth in such a definitive form. It is well-known that the philosophy Sri Madhva propounded, elaborated and defended in all his treatises is one continuous hymn of praise to Visnu. It is saturated with the spirit of Bhakti. But in the actual execution of this act of devotion, the Acarya had to offer dialectical battle on countless exegetical and philosophical fronts. It is a relief to see him, in this hymn, conducting his moving personal devotion in the privacy of his soul and address himself to his God in his choicest modes of adoration. All the Sastras he laboured at are here in their essence and he sets the pattern for future devotional poetry. But the atmosphere is that of the worshipper face to face with his deity. The great Commentators of Madhva, such as Jayatirtha, have not left their elucidation of the stotra. This is a pity. But their mission was to strengthen the philosophical foundations. But some worthy commentaries there are. They have been utilized enough here. The panorama of reality from the Vaisnava perspective is unfolded, the all encompassing glory of Visnu, with all His perfections and authentic manifestations are presented and the duty of man in the matter of karma, Jnana and Bhakti is set down in telling depth and brevity.